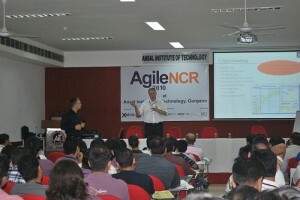 This, and the other post on “day 2” make one of the best coverages of the Agile NCR event. Thanks for a nice blog on AgileNCR. I do not think I am a good speaker but I am trying hard to improve. We are planning to organize next Agile NCR in better weather (Feb 2011) and at a better location (Central Delhi). I appreciate that you traveled from Noida to attend this event during the weekend and got some value out of it. If you win and you are already a CSM then please gift your seat to someone deserving. No, I am not a CSM. All the best for upcoming Agile NCR. This is a great post and may be one that is followed up to see what happens. A close friend e-mailed this link the other day and I am desperately awaiting your next content. Proceed on the superb work. You described Agile NCR event pretty well. Seems it was a good event. Nice to see Agile spreading in India.